These Asian Salmon in Foil Packs is full of flavor and doesn’t call for any unusual ingredients. Just grab your pantry items and get this dinner on the table in 30 minutes! In a small bowl mix brown sugar, soy sauce, honey, lime juice, garlic powder, and sriracha sauce. Stir well. Set aside. Tear off 4 sheets of aluminum foil about 14 inches long. 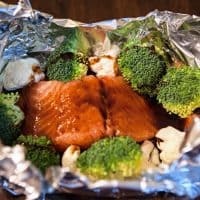 Place one salmon fillet in the middle of each piece of foil. Place broccoli and cauliflower florets around salmon. Place packets on a baking sheet and place in oven. Bake in a 400-degree oven for about 20 mins or until the salmon is cooked through.